You are currently browsing the daily archive for April 20, 2010. Radhika Coomaraswamy - appointed as Under-Secretary-General, Special Representative for Children and Armed Conflict, April 2006. The effort by Gareth Evans to focus attention on Sri Lanka as a situation ripe for invocation of the doctrine of the Responsibility to Protect was not an isolated phenomenon. To paraphrase Lakshman Kadirgamar, if this particular frosting on the cake was prepared in London or in Brussels, from where the International Crisis Group functions, the cake was one that had been baked at home. The guiding spirit behind the exercise was Rama Mani, who had been virtually imposed by Radhika Coomaraswamy as Director of the International Centre for Ethnic Studies. 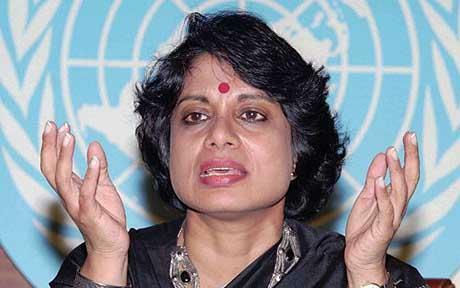 Radhika’s contradictory pronouncements about the suitability of capable Sri Lankan researchers at ICES, such as Pradeep Jeganathan, suggested a determination to keep ICES functioning in terms of her own vision even after she had resigned to take up her current influential position at the United Nations.